SIP AND SHOP Katie Bundschu’s retail shop marries wine with locally made crafts and products with stories to tell. Sonoma needs another winetasting room like it needs more wineries. Abbot's Passage Supply Co. is different. In addition to tastings of blends created under the Abbot's Passage label, the tasting room serves as a general store as well, offering clothing, grooming products, home-décor items and gifts. 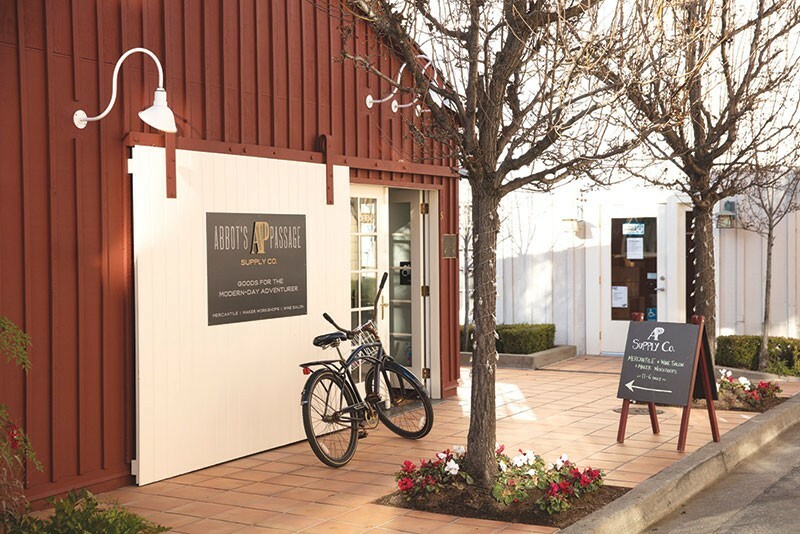 Abbot's Passage, which opened its doors in December 2017, is Katie Bundschu's new take on a tasting room, marrying a concept store with small-lot, co-fermented field blends sourced from vineyards within Sonoma. "We wanted to create a different kind of space, an inviting and engaging place where guests and our community could come together and learn something new," she says. Bundschu is a sixth-generation winemaker from Sonoma's Gundlach Bundschu Winery. She joined the family business in 2012. While the family winery's tasting room is quite traditional, with Abbot's Passage, Bundschu says she wanted "to honor my family's longstanding knowledge of Sonoma Valley by showcasing storied vineyards throughout the valley." Located in an 1886 carriage house, which used to be a hair salon, the shop offers a mix of curated goods and vintage curiosities which, according to Bundschu, "celebrate local craftsmanship, quality and sustainability." In the space, the wine taster and shopper can find a rotating selection of apparel, home décor and jewelry from brands such as Filson, Taylor Stitch, Juniper Ridge, K/LLER Collection and Lovely Bird, with an emphasis on Californian brands which Bundschu says cater to the "modern-day adventurer and explorer." The store is located on the ground floor and the tasting room is tucked away on the second level. The wine and the products, says Abbot Passage's brand manager and creative strategist Liddy Parlato, are designed to play off each other. "The retail [offerings] allows us to tell a richer story about our wine," she says. "The brands were chosen according to characteristics our wine carries, such as heritage, limited production, handmade, artisanal, the element of discovery and adventure." Following the explorer theme, Abbot's Passage offers monthly workshops such as perfume making, oyster shucking and even lock picking. There are also book talks planned with local authors. Is Parlato worried that shopping and imbibing are canceling each other out? Not really. "When people are here for 45 minutes, we make sure we're not cannibalizing one experience for the other," Parlato says. "Some people are intrigued by the products first and then move on to winetasting, and some the other way around." Abbot's Passage doesn't feel like a typical tasting room. It's more boutique than bottle shop, where wine is part of a larger lifestyle and winetasting plays a supporting act. It will be worth watching to see if other wineries follow suit and adopt a similar approach. Abbott's Passage Supply Co., 27 E. Napa St., Sonoma. 707.939.3017.